If you are a creative type, I highly recommend that you watch this video. I have watched it a few times. I love this video. compare to how I felt when I first saw it and left a comment. Your words most definitely struck a cord with me…..
this is truly a treasure I am glad to have stumbled upon……Right now, I feel human. We all struggle to find our own voice. I have a framed art piece (pressed flowers) with the same quote done in calligraphy that my mother gave to me as a gift. On it, the quote is attributed to May Sarton. I've read all of Anais Nin's diaries, but only one book by Sarton. I can't say which would seem more to be the author according to style! 'Tis also a beautiful shot. that is one of my favorite Nin quotes. so very true. Nice quote. Nin or Sarton,.... ? either way it's a keeper! Thanks for sharing. I would not want to have missed seeing this. Love your picture and the quote you shared! What an awesome video, too! Happy Wordful Wednesday! Beautiful :) I am loving the warm weather here in Ohio but I'm more excited to see the trees start to blossom and green just fill everything in! Here's to hoping that comes soon! Love the photo and the quote! Just perfect, as usual! And that video is just riveting. Gives me goosebumps every time I watch it! Photo... Thats better.Again how did you get those bird's to sit for you. Ha Ha. Is that buds I see on those trees??? yay! 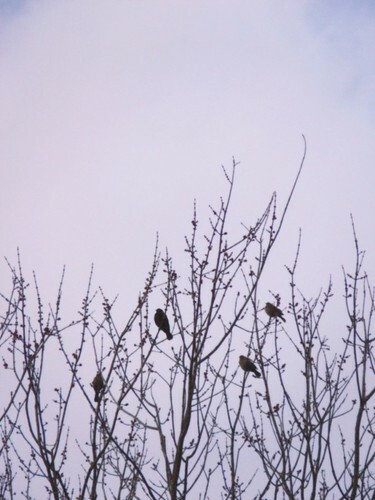 I love the shot of the birds in the tree. That is a familiar site where I live this time of year. After all... tis the springtime, a perfect opportunity to renew oneself, change directions, grow new wings. I would of liked to have seen it, but I could not download. I returned to watch the video. I'm glad I did. It's amazing! Thanks for helping me slow down and realize a thing or two about the path I'm on. yes and many thanks for all the encouragement ! That was really powerful. I am still really digesting all he had to say. I think all "artists" (and that's really what we all are) should see this. Also one of my favorite Nin quotations. It's weird, but I love birds so much. They make me so happy. Wonderful picture. Moving video, and I totally understand what you mean about feeling human. Thanks for posting this amazing video! It sure does speak of hope! I am so glad to have stumbled upon it! i simply had to return to and listen again. it is a long video and worth every bit of the time spent. i too can relate however my doubt-filled angst seems to be on a day by day pendulum rather than on a seasonal one as he describes. the most important message i took form this: don't take myself so seriously :) i hope you are out of your own funk (looks like you are on the upswing from your more recent posts) and congratulations on your photography award! p.s. i have been putting together a little "Photographer's Map" for your trip to Oregon. I have a list of favored locations along the coast that photographers see as prime shooting spots. I really really needed to see that video on photography tonight. Thank you so much for posting it. It made me feel better!